This year, the blog keeps returning to the Himalayas, and there must be something to that: see my earlier posts on the Himalayas here, here, and a 2015 post, here. 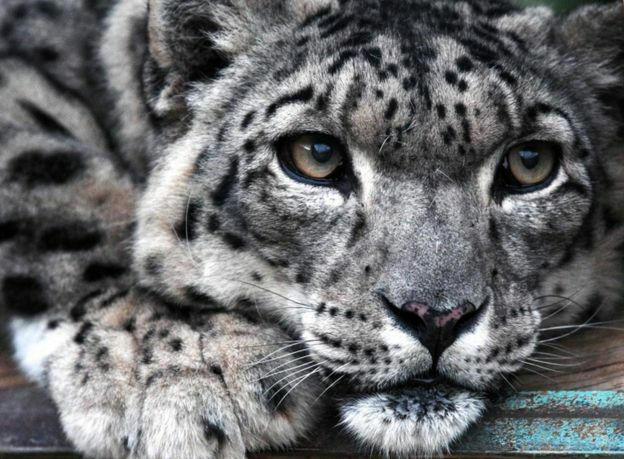 Today's post concerns the BBC report from 14 September 2017 that the snow leopard (Panthera uncia), the great cat of the Himalayas, has been removed from the endangered list, and is now classified as vulnerable. 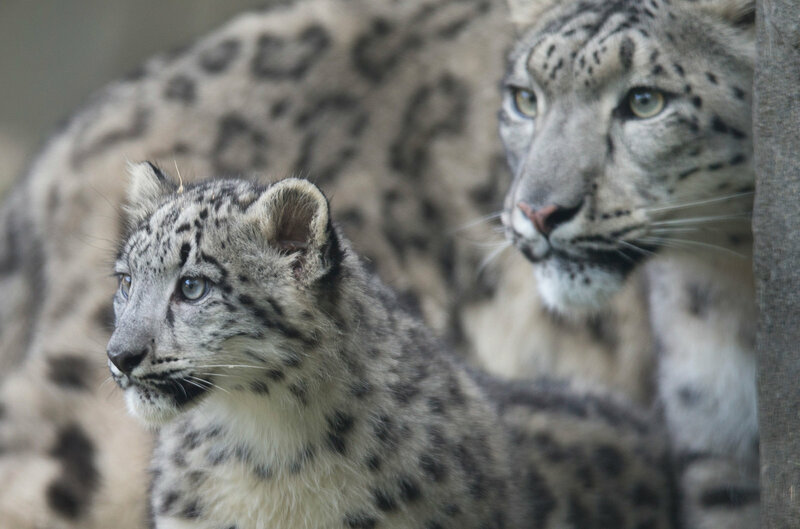 Scientists argue that the reclassification could place these cats at greater risk, but it is still good news that their population has improved. 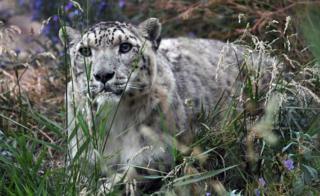 As the snow leopard departs the endangered list, more than 150 species have been added to it. The ash trees of North America, a population of 9 billion trees, have been classified on the brink of extinction, due to an invasive Asian insect, the emerald ash borer (Agrilus planipennis). In the past few years, all the beautiful ash trees around my home in eastern Canada have died or started dying. The Christmas Island pipistrelle bat was declared extinct this month. Image Source: Lindy Lumsden/Mongabay. 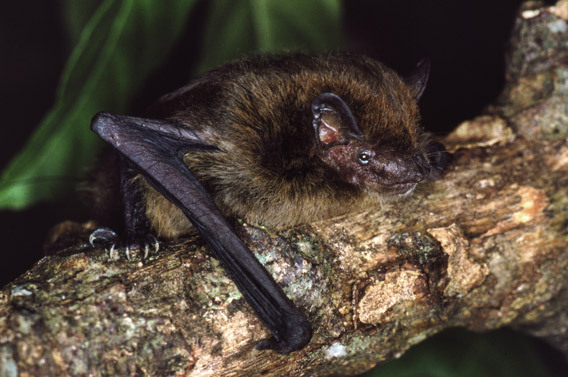 The Christmas Island Pipistrelle vesper bat of Australia (Pipistrellus murrayi) was declared extinct in September 2017. I have previously written on extinctions as less-recognized moments in history and as turning points in time. I have also discussed efforts to use genetic manipulation and cloning to bring back extinct species, as scientists work against the course of time and evolution; this is most noticeable when they plan to revive prehistoric species. Image Source: Scott Olson/Getty Images/NPR. 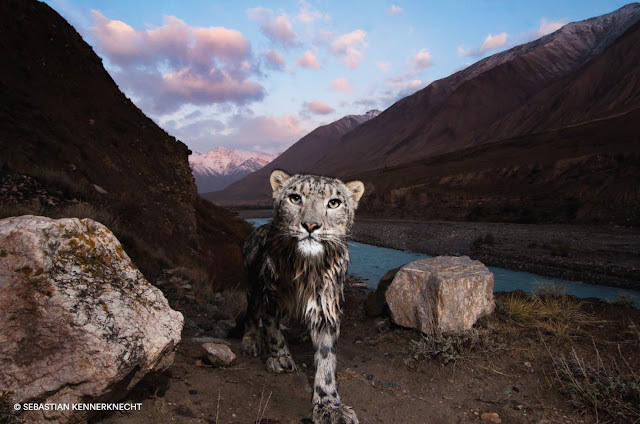 Snow Leopard: First Intimate Images In The Wild - Planet Earth - BBC Earth (12 March 2017). Video Source: Youtube. See all my posts on Extinction. The unmanned drone MQ-9 Reaper, made by General Atomics, designed in 2001, first introduced into use by the US Air Force in 2007. This photo is from Afghanistan. Image Source: US Air Force via Defense Update. "The international community has stressed that drone strikes involve killings without due process that are violating international law and human rights, most importantly the right to life. 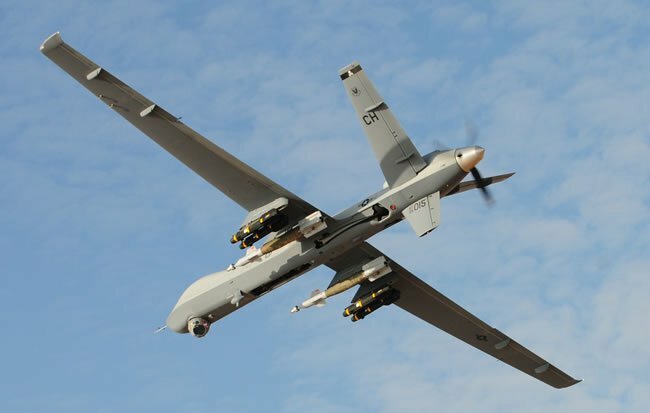 There have been strong concerns that drone operations do not gather sufficient information to establish legal targets, resulting in indiscriminate killings. The precision of drones, so fondly asserted by their supporters, is a myth. Someone who knows all about this crude reality is Brandon Bryant, a former US Air Force drone operator diagnosed with Post-Traumatic Stress Disorder, who is now speaking out to the world on what he experienced during his time flying drones. In the documentary, he describes the light-hearted, often nonchalant, atmosphere in the control room, half a world away from the people they were targeting, and how he himself grew more and more jaded for each strike." "I didn't really understand what it meant to kill at first. It was horrible. Sometimes it plays itself over and over again in your head, so much that you, you just imagine who these people were. We sat in a box for nearly twelve hour shifts. I [was] typically on the night shift. It was quieter. All the lights were usually off, except for the light coming from the monitors. It was so weird just being able to watch people's lives. ... I remember watching a wedding. I mean, these were people enjoying themselves. These were people celebrating, like, a wedding. You know? Like - but someone in that wedding was a bad person, and at that moment, they were celebrating. It's just weird, like, I'm watching this person, and this person has no clue. We're the ultimate voyeurs, the ultimate Peeping Toms. No one's going to catch us, and we're getting orders to take these people's lives. It was just - point and click." Bryant claimed most of his fellow drone pilots did not view their operations that way, and some threatened him when he came forward to criticize drones. At the other end of engagement, civilians sitting under drone attacks regard them as despicable and illegal. Lawyers in Pakistan have taken drone attack cases before their courts as criminal extrajudicial killings. But the paper trail disappears when it reaches the American government's doorstep, due to the confidentiality of unidentified authorities and top secret status of intelligence officers. In 2015, The Guardian called "Obama's drone panopticon" a "secret machine with no accountability." In the old military system, information can pinpoint those who violate military laws and court martial them. In the new military system, information disappears. 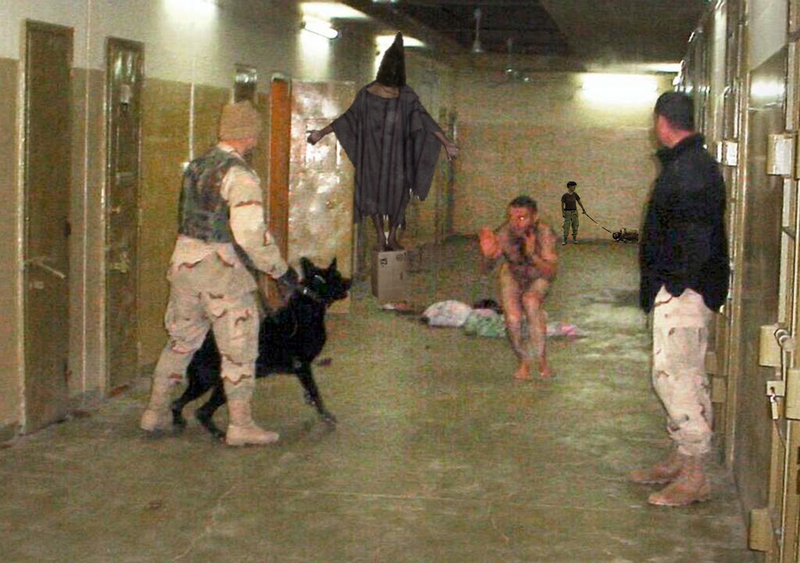 The verdict on conventional warfare from 2001 to 2008: Abu Ghraib prison torture in 2003 Image Source: Progressive Charlestown. 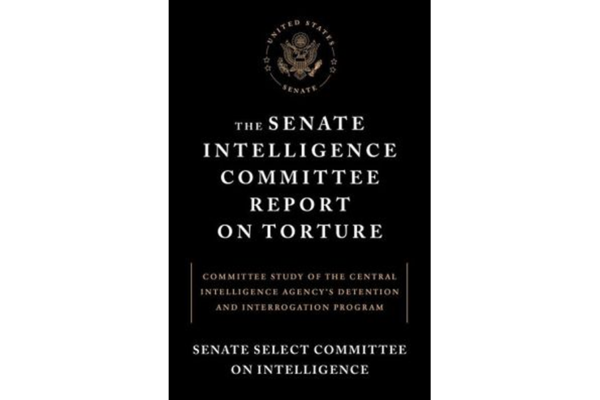 The Senate committee report on torture was published on 30 December 2014. Image Source: Christian Science Monitor. 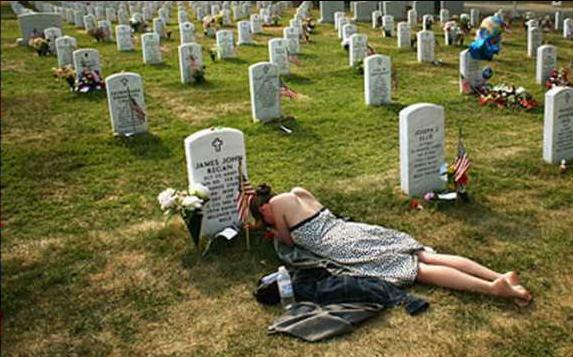 Wife at the grave of an American soldier. Image Source: The Daily Call. Approximately half of veterans (over 1 million former military personnel) returned home to suffer PTSD, drug problems, convoluted governmental support, unemployment in the Great Recession, and other difficulties. A homeless veteran in Houston, Texas. Image Source: IFTBQP. Wiki: "In 2013, the United States Department of Veterans Affairs released a study that covered suicides from 1999 to 2010, which showed that roughly 22 veterans were committing suicide per day, or one every 65 minutes." Barack Obama's drone programme grew out of a catastrophic evaluation of George W. Bush's conventional wars. The Americans faced huge criticism and problems over their handling of the War in Afghanistan (2001-2014) and the Iraq War (2003-present). Abu Ghraib prison, torture, and Guantanamo Bay became ugly mirrors which the big media held up to show a proud nation its shameful inhumanity. The media and experts challenged the justifications and WMD premises for the war. Bush's conventional war was also astronomically expensive. In 2004, Osama bin Laden stated that one of al-Qaeda's aims was to provoke the USA into military conflict to the point of bankruptcy. He almost succeeded. Critics blamed the 2008 meltdown partly on the cost of war. In 2013, Reuters reported that the Iraq War and its related aftermath could cost USD $6 trillion over the next four decades, including interest. Enter the drone, a comparatively cheap, recessionary weapon. In 2015, The Daily Dot reported that Obama requested roughly USD $561 billion in defense spending for the following year, with a growing portion devoted to drones or drone research, to around USD $5 billion by 2016. This was the projected cost of 'soft defense' with a 'small footprint': "While controversial for a variety of reasons, the drone program was supposed to usher in the era of a slimmer, smarter military for the U.S." Bard College has a Center for the Study of the Drone, which broke down America's annual drone budget for 2016 (here) and 2017 (here). According to one PBS opinion piece, the Democrats paid for the drones by printing money, as part of recessionary quantitative easing. So, Obama declared: war is peace. Drone technology effectively continued Bush's Middle Eastern military policy in a different style. Single, targeted drone attacks became more widespread, akin to drone bombing. The Intercept dug through leaked classified drone papers, especially those for Operation Haymaker in Afghanistan in 2012-2013, and found large numbers of civilian casualties. For all the earlier concerns in Iraq and Afghanistan, this was a troubling shift in operational perspective. The Democrats' policy obscured reality, and was conceptually, politically and philosophically dislocated from the reality it created. This war continued mostly out of the public eye, behind a façade of peace. The film Drone maintains that the sympathetic Democratic rhetoric of humanitarianism and frugal economy held the moral high ground over the sabre-rattling of hawkish Republicans. However, the Democrats' withdrawal of troops and peaceable rhetoric cynically, strategically - and progressively - continued the war with drone technology and mercenaries, who replaced American soldiers on the ground. 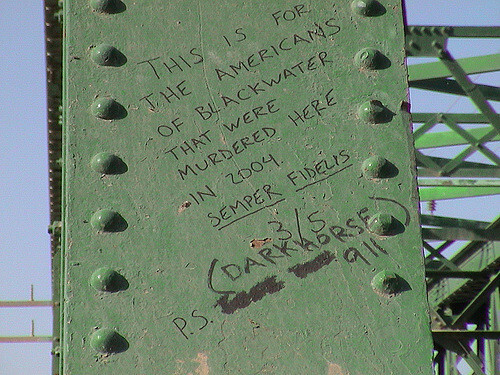 Blackwater gained public attention when four of their mercenaries were ambushed, killed and burned on a bridge in Fallujah, Iraq, on 31 March 2004. It took two military battles for the Americans to take the city. After the victory in December 2004, the Marines signed the bridge with their Latin motto. In the photo above, 3/5 is the 3rd Battalion, 5th Regiment of the Marines, also known as the Darkhorse. From 2005 to 2011, investigative reports linked birth defects in Fallujah to the US Army's use of white phosphorous. The incident showed how unconventional mercenaries and weapons overlapped with conventional forces and the media. Images Sources: Mount Holyoke University; flickr. The employer-reviews Website, Glassdoor, has employees' reviews of International Development Solutions; one reads: "Great pay. Travel is awesome. [But y]ou're away from home quite often." Darker parts of the story emerged in 2016 about an embryonic private air force (here and here), while ex-Blackwater CEO Erik Prince aided in China's quiet imperial conquest of Africa. One blog devoted to overseas military contractors calls them "the best kept secret of the wars." Contractors and drones allowed war to disappear (largely) from the media; conflict faded into the background behind the term, 'deniability.' Regardless of the winner in the American presidential race, this approach will continue. The current foreign policy advisor to Donald Trump is Joseph Schmitz, a former Blackwater executive. Even more than before, politicians separated cause from effect and meaning from reality. This policy created two contemporary historical narratives, the politicized metahistory, and the factual course of events. The misleading image of a kinder, gentler government became easier to cultivate, because warfare was conducted through several degrees of separation and obscured political responsibility. Drone argues that Obama disapproved of Guantanamo Bay, so he solved that problem by killing suspects with drones, thereby avoiding the public relations mess of capturing, incarcerating them and facing scrutiny over that process. Critics in Drone maintain that this policy by-passed international and national legal systems (as opposed to violating them, as the Bush administration had). Other critics assert that the same policy encouraged the rise of ISIS. Drones are one of the reasons why ISIS are so keen to provoke the Americans back into boots-on-the ground, hand-to-hand combat in the Middle East. In their eyes, a bloody human clash is the true contest between societies, and remote-piloted drones are the weapons of cowards. Purported drone killing (12 November 2015) of 'Jihadi John' aka Mohammed Emwazi (born Muhammad Jassim Abdulkarim Olayan al-Dhafiri), a Londoner who beheaded several high-profile western captives for ISIS, including American journalist James Foley on 19 August 2014 (see my post on Foley's beheading here). ISIS confirmed Emwazi's death in January 2016. The gamer who posted this video on 13 November 2015 rejoices in the killing. This is likely the wrong footage, revealing public difficulty in confirming the details of drone warfare. According to the Daily Mail, Emwazi was killed on a street while talking on his cell phone. Video Source: Youtube. The psychological orientation of drone battle is different from conventional warfare. One army sits, thousands of miles away from the arena of action. Their engagement is virtual, disconnected from direct combat, and they target enemies dispersed among a civilian population. The documentary observes that human operators of drones will soon be replaced by computer algorithms, thus making the targeting of undesirable individuals in the world nearly fully automated. Proponents of algorithmic pilots argue that an algorithm is more objective than human drone operators. At present, the human decision to assassinate an individual or group depends on intelligence analysis and a chain of command. The intelligence is gathered through governmental monitoring of private citizens' information, combined with international intelligence tips - including, the film asserts - from the European Union, whose governments have not criticized Obama's policy on drones. "It's a very different youth group that we're dealing with, that we're forcing into this environment of killing. And it's a very different form of killing, when you're in Nevada and the people you're killing are ten thousand miles away. We have something in the armed forces that we call the 'warrior ethos.' You destroy that when you go out and kill people and you're totally invulnerable. I think the drone business, the distance imposed, amplifies this a hundredfold. And the distinction between killing for state purposes under just war theory and killing for state purposes with no vulnerability is, I think, the difference between killing in a way that is recognized and legalized, even, and murder. How did we get to the point where we're no longer warriors, we're murderers for the state?" Image Source: The Culture Concept. Any apiarist, keeping watch over a hive of bees sleeping through the winter, would tell you that civilization can only function under certain circumstances. Apiculture is one of the world's oldest professions. It is a founding pillar of agriculture. In colony collapse disorder - now threatening beehives across Europe and North America - workers stock up a hive but then abandon their helpless queen. The plague is blamed on pesticides, pathogens, and mobile phone towers, with bee-keepers reporting that roughly one third to one half of their hives have been dying over winters every year for the past decade, despite various high tech solutions. It is hard to say how new this disaster is. There were reports of 'mystery diseases' and 'disappearing diseases' in hives in 1918-1919 and in the mid 1960s. Whatever the causes, the insects' tiny world of flowers and pollination remain critical to human survival. In 2010, the United Nations estimated that the worth of global crops pollinated by bees was 153 billion euros, or "9.5 per cent of the total value of human food production worldwide." Image Source: My Greek Spirit. 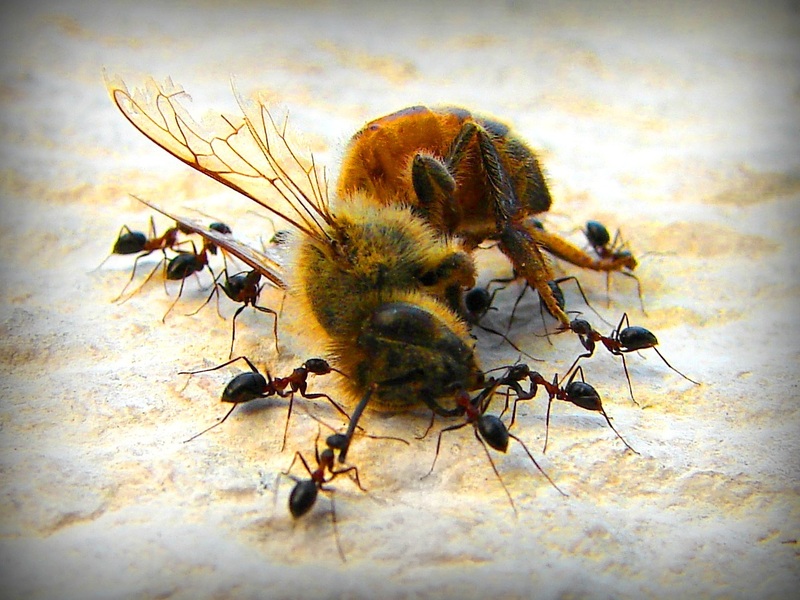 The remarkable way bees organize themselves remains symbolically powerful. Their honey production makes their system seem much friendlier than the terrifying laws that govern your average ant hill. Any agricultural society would see bees as the civilized agents of the natural world, a properly arranged mini-society with a sweet output. 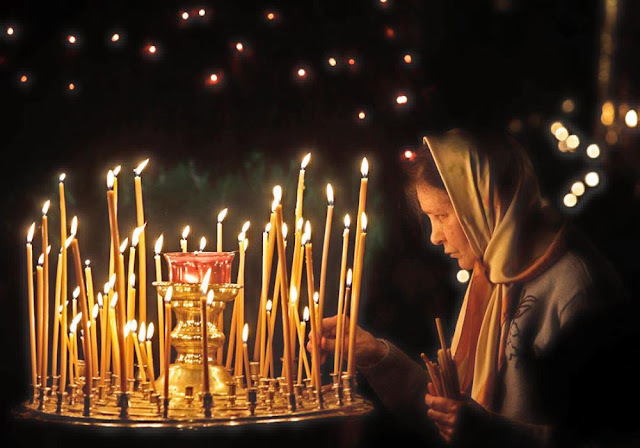 Today, 7 January 2015, is Eastern Orthodox Christmas. Due to the traditional symbolism of the apiary, beeswax candles are held in special esteem in Orthodox rituals. 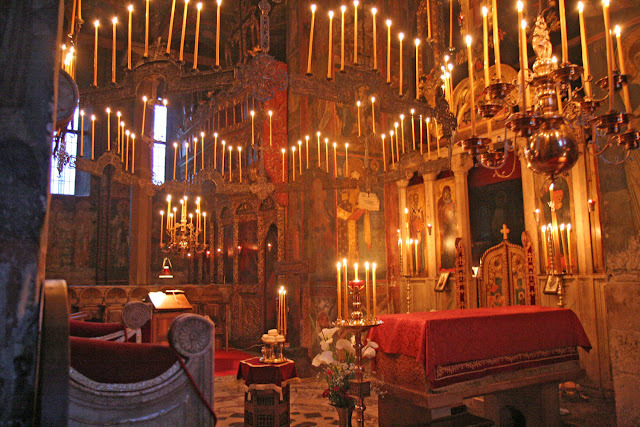 At Mystagogy, John Sanidopoulos explains that for Orthodox Christians, beeswax candles symbolize purity, adaptability of the heart, forgiveness of sins, and divine grace garnered from the wax's floral sources. Candlelight and the sweet smell of burning beeswax recall summer days to illuminate and banish darkness caused by fear, corruption and misery. 3 December 2015: "A professor at Texas A&M University posted these photos to Facebook. 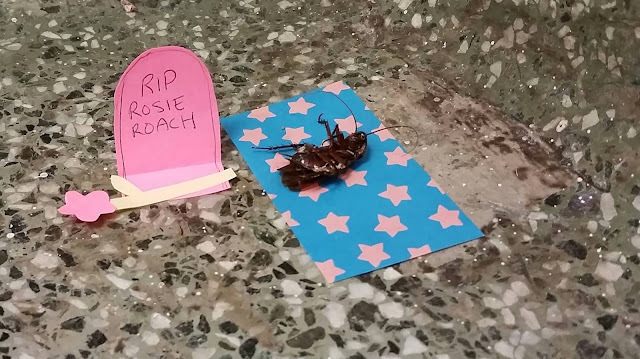 'There has been a dead cockroach in the Anthropology building's stairwell for at least two weeks. Some enterprising person has now made her a little shrine.'" Images and Text Sources: Facebook via imgur. In November, a cockroach died in the Anthropology stairwell at Texas A&M University. Then Facebook took over after the Anthropology Department went all Princess Diana-Burning Man to bid the cockroach goodbye in December. 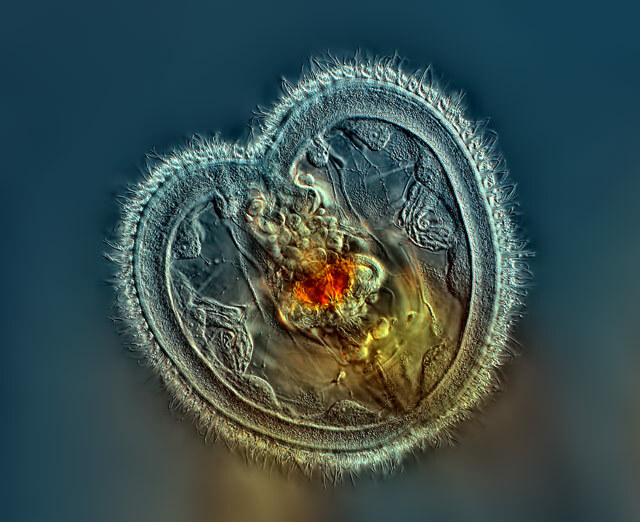 Rotifer showing the mouth interior and heart shaped corona (40x) by Rogelio Moreno (2014). 1st Place. 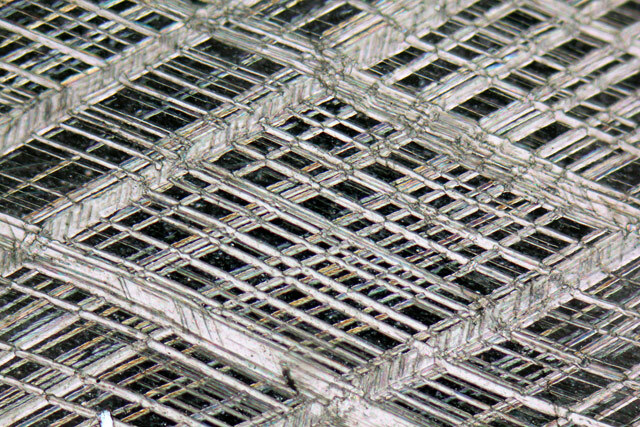 Rhombohedral cleavage in calcite crystal (10x) by Alessandro Da Mommio (2014). 2nd Place. Horror has a philosophical side. Western horror stories are usually social commentaries, not that different from morality plays of the middle ages. A regular at Scans Daily remarked: "a lot of horror ... raises the question of 'Who is the real sick man ... in this so-called society?'" In Asia, there is a greater sense of continuity between non-being, being and death, so hungry ghost stories often involve reincarnation or karma (see related posts here and here). You can find no better blend of eastern and western traditions than the ghost stories of Lafcadio Hearn (1850-1904), an American who lived in Japan. I have previously mentioned his 1899 collection of ghost stories (which you can read online here) in this post. Sometimes, the bridge between different human traditions is a non-human perspective. Other creatures bear witness on the other world, or afterlife, or the paranormal world beyond our senses. 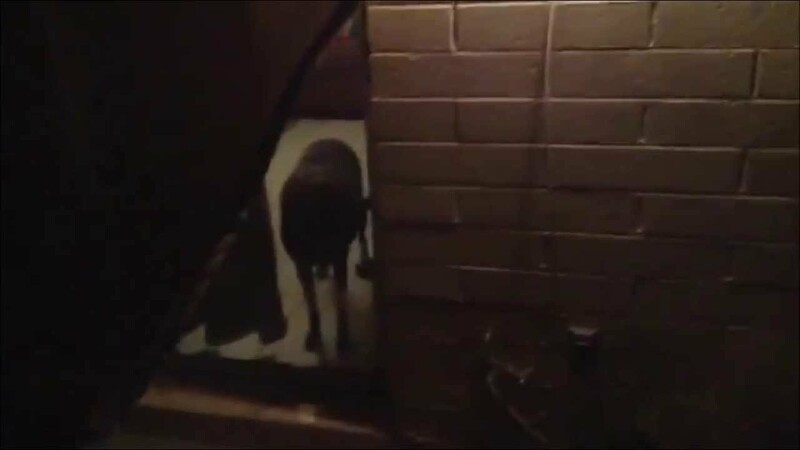 Youtube has many videos made by dog owners who claim that their dog can see a ghost. Lafcadio Hearn came to the conclusion that domesticated creatures' lives are so intertwined with human lives that they, with their fundamentally different ways of being, mirror some of the things we cannot understand about ourselves and our existence. These creatures are so tied to us that they mirror these hidden truths within the human space. Our pets also perceive some of the things we cannot usually sense - including, in Hearn's view, ghosts. The alien familiarity of silkworm moths (Bombyx mori); cultivated for over 5,000 years in China (possibly since the end of the Neolithic Age) to produce silk, the insects no longer exist in the wild. They can't fly and are completely dependent on humans in order to eat and survive. Image Source: Science Image. If you don't want to read Hearn's stories, you can hear them below the jump. They have been prepared as an audiobook by LibriVox recordings. It is not shock or gore and can seem dry, but if you have time to listen to this video, In Ghostly Japan conveys the real meaning of horror. Hearn ponders mundane subjects, then veers off into horror, relating it to life's greatest mysteries and philosophical questions in a mind-blowing, sometimes very scary way. Humped, or Creeping, Bladderwort (Utricularia gibba) (click to enlarge), First Place in the Olympus BioScapes Imaging Competition (2013). Image Source: Igor Siwanowicz, HHMI Janelia Farm Research Campus, Ashburn, VA via NPR. 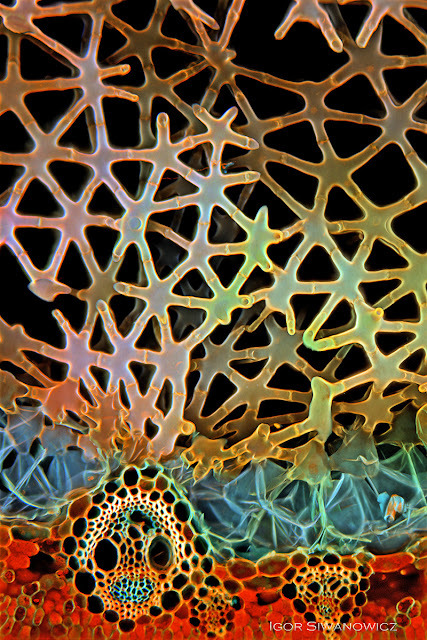 Igor Siwanowicz, a neurobiologist at the Howard Hughes Medical Institute's Janelia Farm Research Campus ... magnified the plant 100 times using a laser scanning confocal microscope and used cellulose-binding fluorescent dye Calcofluor White to visualize the cell walls of the plant. 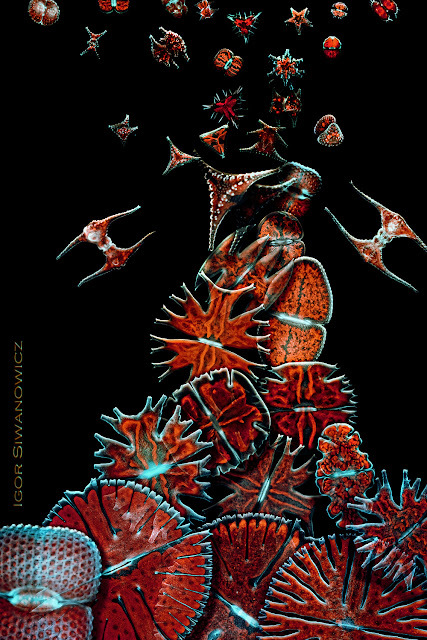 Siwanowicz's personal gallery of microscopic photos is here; the gallery has an e-card function, in case you need to scare (or delight) your friends over the holidays. 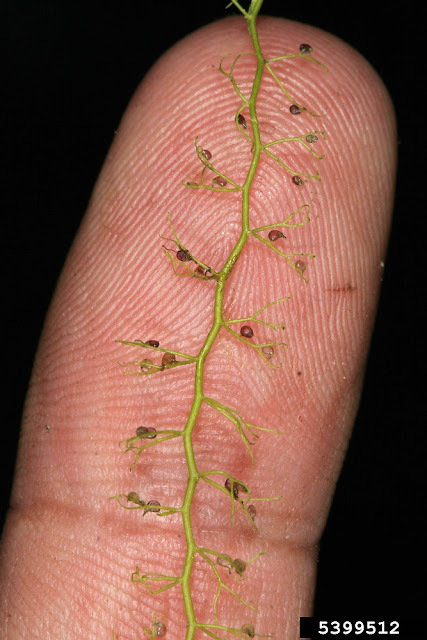 The Humped Bladderwort to the naked eye. Image Source: Go Botany. Directly below, see more microimages from Igor Siwanowicz. Two male African mantis Pseudempusa pinnapavonis square off. Image Source: Igor Siwanowicz via HuffPo. 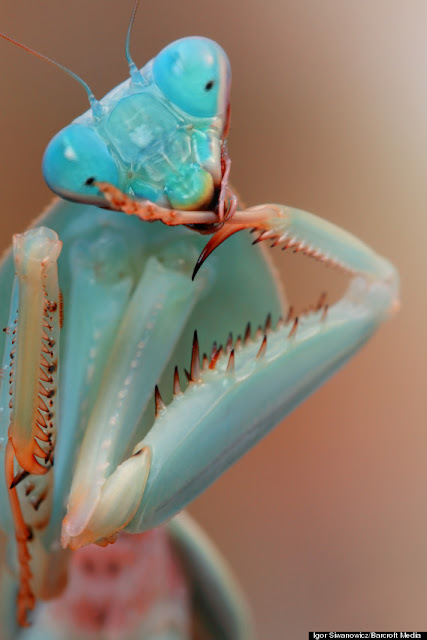 "A Giant Malaysian Shield Mantis cleans its tarsus (the last segment of an arthropodís leg) in Igor's home studio in Munich, Germany." Image Source: Igor Siwanowicz via HuffPo. Desmids (a type of algae). Image Source: Igor Siwanowicz. Cross section of a Juncus sp. leaf (a type of rush grass). Image Source: Igor Siwanowicz. Below the jump, see more winners and honourable mentions from the Olympus BioScapes competition. 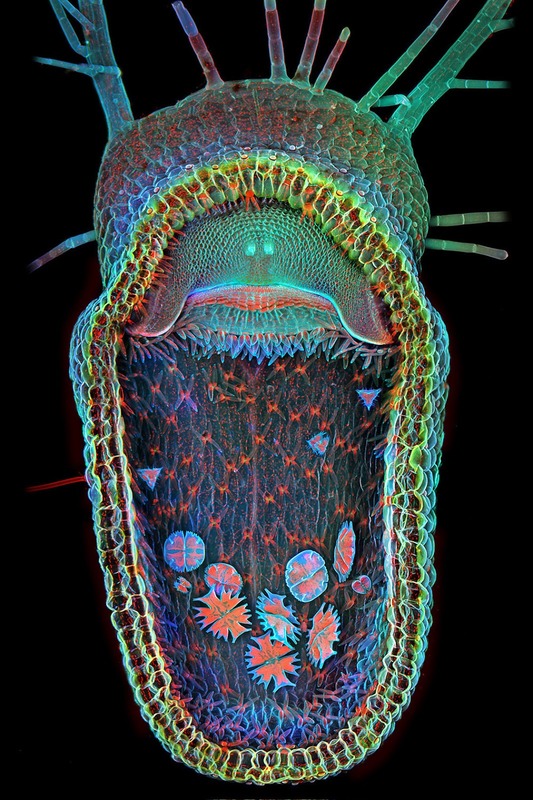 The images are taken from the Olympus BioScapes 2013 Winners Gallery. All images here are copyrighted by the original photographers and are reproduced under Fair Use for non-commercial discussion and review only. Image Source: Snippets and Snappets. There are a few unsettling nuclear headlines circulating at present. Bill Gates is set to spend billions of dollars of his own money on the development of mini nuclear reactors which will operate continuously for 30 years. Presumably, this means that he expects to make many more billions back on his investment. After a leak at a Swiss nuclear plant which contaminated drinking water from Lake Biel, attention returned to Japan. The steam was noticed at 8:20am by repair crews tasked with removing contaminated debris from the building, which was badly damaged by the magnitude-9 earthquake that struck on March 11, 2011, and further battered by the subsequent tsunami. The roof and walls of the upper stories of the building were torn off by a hydrogen explosion in the days after the disaster. "All work to remove debris in and around Unit 3 was stopped," a spokesperson for Tokyo Electric Power Co. told The Daily Telegraph. "We have confirmed that radiation levels around the pressure chamber have not changed and at 9:20am we were able to confirm that the reactor has not reached criticality." Tepco is collecting samples of air above Unit 3 and the assumption at the moment is that the steam is from rain that entered the reactor building and collected in the well beneath the pressure chamber where it became heated. The incident is likely to raise new concerns about progress to bring the situation under control at the Fukushima plant. Tepco confirmed recently that high levels of radioactivity had been detected in ground water in a well drilled to determine the spread of radioactivity beneath the plant. Some 900,000 becquerels of radioactive substances were found per litre (0.22 gallon) in a sample taken from the well, which is just 80 feet from the coast. 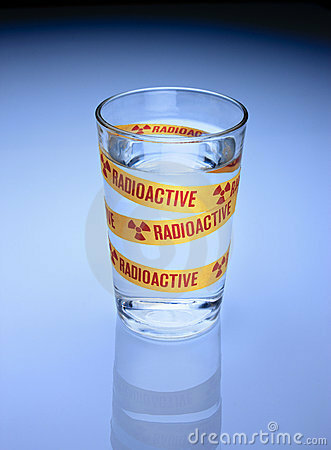 The radioactivity included strontium and Japan's Nuclear Regulatory Agency has set the safety level for radioactivity in drinking water at 10 becquerels per litre. The authorities have said it is highly likely that the radioactivity is already leaking into the sea around the plant, despite efforts by Tepco to complete a concrete wall set deep into the ground to restrict the flow of groundwater. [W]orkers were ready to inject water containing boric acid into the reactor from the outside at any signs of further trouble, like a rapid rise in temperature or radiation parameters, the company said in an e-mailed statement. Such spikes would raise the chilling possibility of criticality in the reactor’s damaged fuel, most which is thought to have melted and slumped to the bottom of its containment structure after the hydrogen explosion, one of several at the site in 2011. Boric acid would slow that rate of fission, preventing the worst-case scenario of uncontrolled nuclear chain reactions in the core. In other words, if the core in reactor #3 were to reach criticality, we would have a nuclear reaction open to the environment, as happened at Chernobyl. However, officials urge calm, because the steam is apparently coming from between the Device Storage Pool (DSP), or from an area between the DSP and the containment lid. The most recent guess from TEPCO is that rainwater was heated and steaming on the containment lid. Should the lid really be that hot? Image Source: Hamed Saber from Tehran, Iran via Wikimedia. Birds, Animals and Insects Hold Funerals for Their Dead? 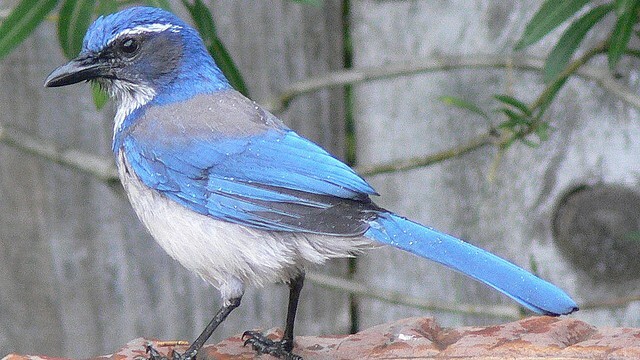 Researchers at UC Davis have observed this funereal behavior in western scrub jays. When one bird spots a dead jay on the ground, it stops what it was doing and starts sending out loud alarm calls. The calls bring in jays from all over, who gather around the body and continue sending out the alarm calls so that as many jays as possible show up near the dead body. Of course, it's unlikely that these alarm calls are the western scrub jay equivalent of a eulogy. Instead, the researchers are pretty sure that the dead body functions as a warning that predators are nearby, and the jays treat this information seriously enough to gather their entire population around the site of the death. The sight of death had a profound enough effect on the jays that they stopped foraging for the rest of the day, although exactly why this behavior change occurred is difficult to say. It's tempting to say they were too grief-stricken to eat, but we simply don't have enough information to make that assumption. When the birds were fooled into thinking a predator had arrived, by being exposed to a mounted owl, they also gathered together and made a series of alarm calls. They also swooped down at the supposed predator, to scare it off. But the jays never swooped at the body of a dead bird. The birds also occasionally mobbed the stuffed jays; a behaviour they are known to do in the wild when they attack competitors or sick birds. The fact that the jays didn't react to the wooden objects shows that it is not the novelty of a dead bird appearing that triggers the reaction. The results show that "without witnessing the struggle and manner of death", the researchers write, the jays see the presence of a dead bird as information to be publicly shared, just as they do the presence of a predator. Read the full scientific paper in Animal Behavior. The BBC observes that whole disciplines of research are devoted to whether animals and birds display comprehension or distress when one of their number dies. Of course, awareness of death has long commonly been considered to be the hallmark of human consciousness. The language of death is the language (we think) of our knowledge of our own souls. Operation Plumbbob: Detonation Fizeau. 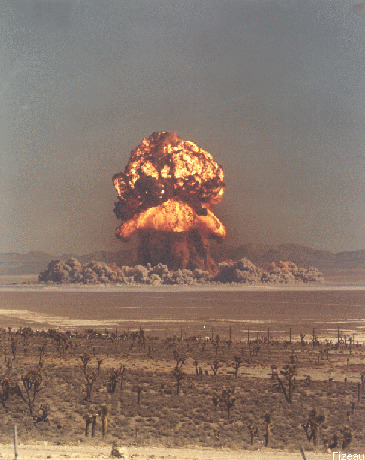 Image Source: Nuclear Weapon Archive. Following advances in nuclear science in the 20th century, mutants have become a popular way of understanding the impact of radioactivity. In 2004, an academic from the University of Chicago argued that that perception was changed to reconcile certain ironies about nuclear science. Those ironies concern the fact that both nuclear weapons and nuclear power were devised to protect advanced nations' security and energy interests. But the great powers' superpowers came at a price: nuclear weapons and power have grim cultural and environmental impacts. Worse, those impacts have already been felt. The greatest irony arises when one considers that bomb detonations and radioactive fallout have already occurred. In North America, it happened during atomic testing that began in 1951. In other words, the apocalypse has already happened; it was self-inflicted. We have been living in the slow burn aftermath ever since. In April 2012, HuffPo reported that since February, 3,000 dead dolphins have washed up on Peruvian shores, as have thousands of dead anchovies. In addition, 1,200 pelicans have died (other reports from the end of April put the number at 538); other dead seabirds include boobies (54) and gannets. On 30 April 2012, the Peruvian Production Ministry was investigating pelican deaths, stating: "They did not show evidence of having been washed up dead by the sea. The mortality appeared to have occurred on the beach." Scientists have not explained why the dolphins are dying, although they assume it has to do with oil companies' activities along the coast and their possible use of underwater sonar. The Peruvian Production Ministry is still testing the causes of dolphin mass mortality in this case. For other reports, see here and here. 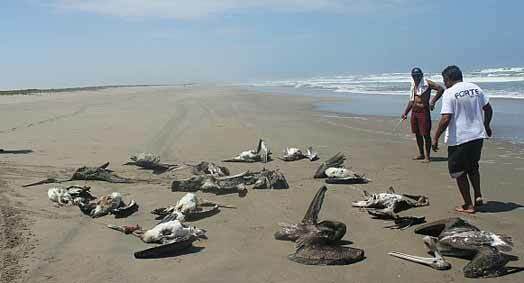 Hundreds of dead pelicans have been found on the Peru coastline, "along a 70-kilometer (43-mile) stretch of beaches around San Jose Bay, located in Lambayeque region" (April 2012). Image Source: Hispanically Speaking News. 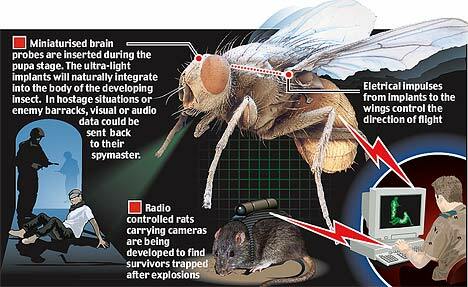 Image Source: Parasites and Vectors. From Twitter: "Whoa! 20 million year old fly in amber was carrying malaria, and sucking bat blood" (Hat tip: Bug Girl). 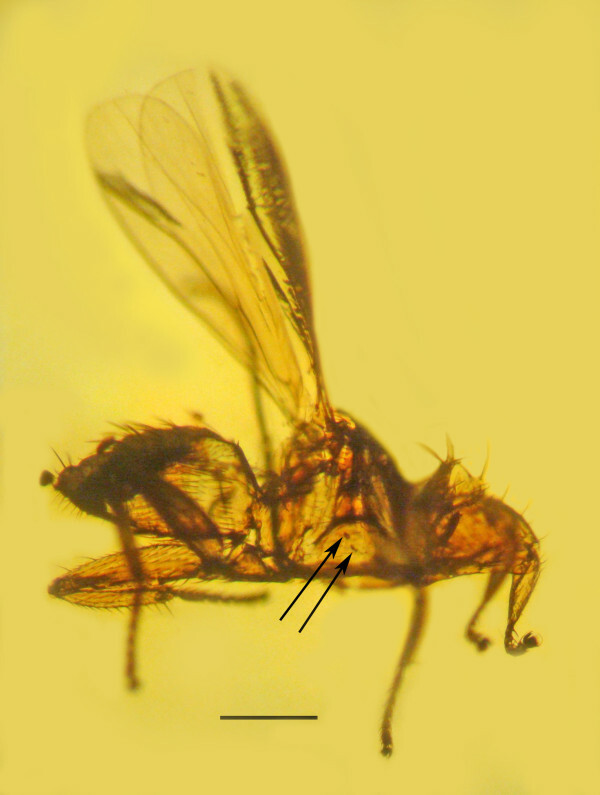 This fly, encased in amber, lived in the mid-Tertiary period, a violent time running from the extinction of the dinosaurs, to the beginning of mammals, to the onset of the beginning of the most recent Ice Age. This period featured one of the largest volcanic eruptions ever to occur on the planet (it took place in Colorado). The Tertiary period was initially classified in the 18th century by Italian geologist Giovanni Arduino as the period of the Biblical Flood. The tweet refers to an article at Parasites and Vectors, concerning research into the form of malaria carried by this fly. A Bush Cricket, or Katydid. Image Source: Wiki. The fossilized remains of long-extinct animals provide clear evidence of their size, stature and gait, but can we ever know what they sounded like? A reconstruction of the song sung by a fossilized katydid that lived 165 million years ago shows how it can be done. The results are published in the Proceedings of the National Academy of Sciences (PNAS). 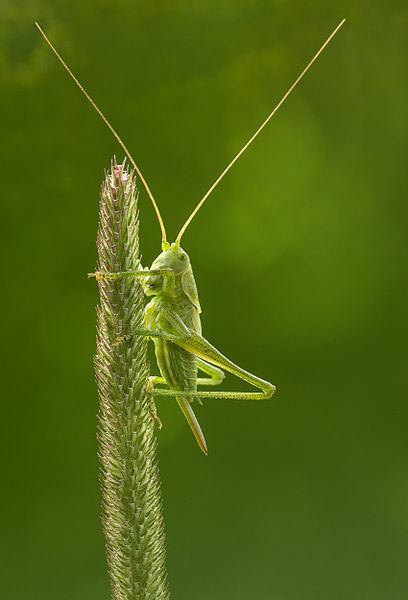 Like other crickets, male katydids (also known as bush crickets) sing to females through a technique called stridulation, in which noise is generated by rubbing a thick, ridged vein (called a file) on one wing against a ‘scraper’ on another. The length of the file, and the speed with which it is dragged over the scraper, determines the frequency of the noise it generates. The fossil katydid in the new study, dubbed Archaboilus musicus and described in the PNAS paper for first time, is exceptionally well preserved for such an old specimen, allowing for detailed measurements of the sound-making file. Now Matti Mintz of Tel Aviv University in Israel and his colleagues have created a synthetic cerebellum which can receive sensory inputs from the brainstem - a region that acts as a conduit for neuronal information from the rest of the body. Their device can interpret these inputs, and send a signal to a different region of the brainstem that prompts motor neurons to execute the appropriate movement. "It's proof of concept that we can record information from the brain, analyse it in a way similar to the biological network, and return it to the brain," says Mintz, who presented the work this month at the Strategies for Engineered Negligible Senescence meeting in Cambridge, UK. One of the functions of the cerebellum is to help coordinate and time movements. This, and the fact that it has a relatively straightforward neuronal architecture, make it a good region of the brain to synthesise. "We know its anatomy and some of its behaviours almost perfectly," says Mintz. The team analysed brainstem signals feeding into a real cerebellum and the output it generated in response. They then used this information to generate a synthetic version on a chip that sits outside the skull and is wired into the brain using electrodes. To test the chip, they anaesthetised a rat and disabled its cerebellum before hooking up their synthetic version. They then tried to teach the anaesthetised animal a conditioned motor reflex - a blink - by combining an auditory tone with a puff of air on the eye, until the animal blinked on hearing the tone alone. They first tried this without the chip connected, and found the rat was unable to learn the motor reflex. But once the artificial cerebellum was connected, the rat behaved as a normal animal would, learning to connect the sound with the need to blink. Such mechanised animals, or cyborgs, have many advantages over robots. Sharks, moths and rats, for example, have an amazing sense of smell that allows them to detect the faintest traces of chemicals. And if you can hide the controls within the creature’s body, it would be virtually indistinguishable from any other animal – and so the perfect spy. Chief among the cyborg inventors is the U.S. military, with its research bureau ploughing money into projects from remote-controlled rats to battery-operated beetles. Trained to sniff out particular scents, such as human bodies or explosives, the rats’ movements are controlled by electrodes implanted in their brains. Video camera backpacks transmit images of their mission back to the spymaster. Although the U.S. has stopped funding the rat research, the Israeli government is keen to use the creatures to search for survivors of explosions. While rats might be big enough to carry video cameras and other paraphernalia, their size makes it difficult for them to blend into the background. With this in mind, the U.S. Defense Advanced Research Projects Agency has switched its focus to insects such as moths and beetles. In an attempt to make the insects as inconspicuous as possible, miniaturised brain probes are inserted during the pupa stage. 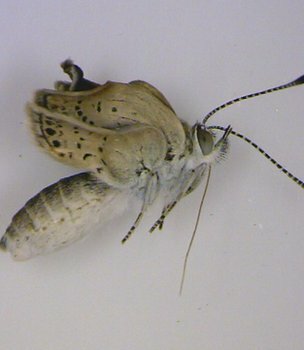 The idea is the ultra-light implants will naturally integrate into the body of the developing insect. 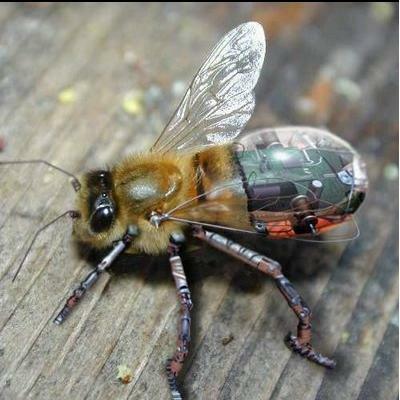 DARPA’s ultimate aim is to create cyborg insects that can fly more than 300 feet to their target and then stay put until commanded to buzz off again. AFTER buttoning up a lab coat, snapping on surgical gloves and spraying them with alcohol, I am deemed sanitary enough to view a robot's control system up close. Without such precautions, any fungal spores on my skin could infect it. "We've had that happen. They just stop working and die off," says Mark Hammond, the system's creator. This is no ordinary robot control system - a plain old microchip connected to a circuit board. Instead, the controller nestles inside a small pot containing a pink broth of nutrients and antibiotics. Inside that pot, some 300,000 rat neurons have made - and continue to make - connections with each other. As they do so, the disembodied neurons are communicating, sending electrical signals to one another just as they do in a living creature. This evening I watched the stars in a yard full of fireflies. The sky winked down at Earth and the darkened countryside winked back at the sky. I started thinking what it must have been like before Christianity, when people believed old religions and animism. Although it's pretty evident that a lightning bug is a lightning bug, I could imagine how pre-Christians could have invented fairies in these hushed, night landscapes, as the heat of the day dispersed into evening mists. 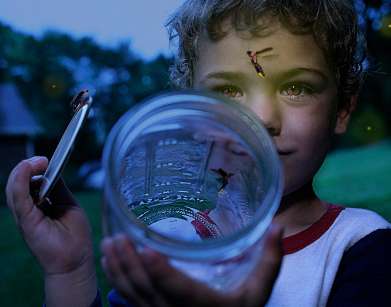 There's an interesting blog post on fireflies' bioluminescence as a metaphor for the brevity of existence here. Nuclear Memories (14 August 2009). Image © ~cuber/Vladimir Petkovic/Vladimir Studio. Image reproduced with kind permission. Today, the news is grim, but not as dire as it was on 27 May, when a Super-typhoon known as Songda, then a catergory 5 storm, appeared set to hit the Fukushima plant directly. By 28 May the storm was downgraded to a category 3 and changed its path slightly. As 'Tyler Durden' at Zero Hedge remarked: "The good news: by the time it passes over Fukushima, Songda will be merely a Tropical storm. The bad news: by the time it passes over Fukushima, Songda will be a Tropical storm. As the latest dispersion projection from ZAMG shows, over the next two days the I-131 plume will be covering all of the mainland." The fallout will also be blowing over the Koreas, eastern China and eastern Russia at this time. The real danger from Songda (aka Chedeng), aside from the nightmare of coping with three simultaneous meltdowns in a typhoon, is that radioactive fallout will be carried up into the atmosphere by the storm system. Image Source: Weather Underground (Hat tip: Zero Hedge). Video Source: ZAMG via Zero Hedge. In addition to the position of the I-131 plume (we're not even talking about the presence of plutonium at the site, which isn't being discussed much), there are almost 100,000 tonnes of radioactive water at Fukushima, not including the radioactive water already released into the sea and polluting the immediate vicinity in the Pacific. 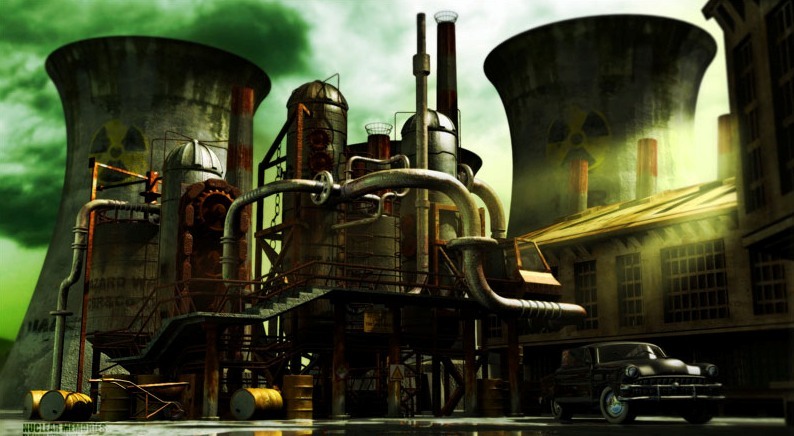 And while the amount of radiation released is currently 10 per cent of that released at Chernobyl, a TEPCO official has estimated that Fukushima's radioactive fallout released may eventually exceed that of Chernobyl. There is a constant trickle of problems reported, most recently, a fire at the neighbouring Dai-ni Fukushima plant (not the one where all the problems are) and cooling system failure in Reactor #5 at the Dai-ichi plant. There isn't much on the Web that states how storm systems like typhoons, hurricanes and tornadoes might carry radioactive fallout along with regular wind patterns. Certainly, a tornado carried fallout at Kyshtym, when it touched down on a radioactive dried lake bed where waste had been dumped, turning the site into a nuclear disaster zone of seriousness equal to Hiroshima. You can trace the daily radioactive plume over Fukushima here. You can follow the daily Jet Stream projections over North America, here. Meanwhile, the American Midwest is getting catastrophically battered by tornadoes, which not only potentially carry Japanese fallout while spreading disaster; they have caused little-reported damage to American nuclear plants in Alabama as well. When you add the flooding that damaged other nuclear plants along the Mississippi River, which involved the release of radioactive water into the river system, followed by tornadoes that pick up the water and carry it into the atmosphere and an unusually high level of North American spring rainfall - well - it's starting to look like a house of cards. Meanwhile, as if matters in the civilian nuclear sector were not bad enough, nuclear weapons problems are also looming. Even in circles noted for sober assessments, observers commented this past February that Iran could develop a nuclear weapon within one year and missile capabilities within two years; according to Mark Fitzpatrick of the International Institute for Strategic Studies in London: "Whichever method were used, at least six more months would be required to convert the gasified HEU into metal and fashion it into a weapon. The minimum timeline, then, for the first weapon, is over two years under the Pakistan method and one year for the batch method. Developing a means to deliver a nuclear weapon adds to the timeline. Last May , in a companion Strategic Dossier on Iran’s Ballistic Missile Capabilities, the IISS concluded that Iran’s Sajjil-2 missile, which has a range of about 2,200km, is still two to three years of flight testing away from becoming operational." But even in the face of horror, we can find something beautiful. Two stories on Fukushima and Chernobyl are reminders of this. On the day of the Japanese earthquake, the telescope at the Hoshi no Mura ('Village of Stars') Observatory in Tamura, Fukushima Prefecture, cracked in half; one portion of the telescope, weighing about three tonnes, rolled down and crushed the seat of the astronomer. Fortunately, the director, Hiroaki Ohno, was away at lunch. Despite being only 33 kilometres from the plant and just outside the evacuation zone, Ohno is still attending to the facility. He is also seeking to help local evacuees, and has been travelling to shelters with small telescopes. Taking advantage of the fact that all city lights are turned off in the region, he is teaching them how to look through these telescopes to see the stars. From the Japan Times: "'A bedridden woman came out of the evacuation shelter once in a wheelchair to take a peek. She told me she could distinguish the rings around Saturn,' Ohno said. The planets and stars appeared to provide much-needed cheer in the evacuees' lives, he added." The twenty-fifth anniversary of Chernobyl last month also inspired a renewed appreciation of the natural environment in the evacuation zone. Boing Boing ran a piece on the sounds of birds, animals and insects there at dawn and dusk (-Thanks to J.). The recordings were made by London sound artist Peter Cusack in 2006; you can listen to them here. In addition, a charity album of dark ambient and horror music, Remember Chernobyl, was composed to commemorate the anniversary. There is an album sampler from Ambientaria Records, below the jump.